Before we went to bed last night we did some tidying up, but not enough. This morning we had to return the kitchen and living room back to normal. Actually it didn’t take that long. It never does when two people work together and that’s what we did. In a few hours we had everything under control and it was time for lunch. After a ‘normal’ Sunday lunch we settled down to watch a grumpy Lewis Hamilton lose the British F1 GP to Sebastian Vettel. Poor little rich boy never, ever shunted anyone off the track in his life, apparently. It was a good race though with a fair bit of action on a fast track. 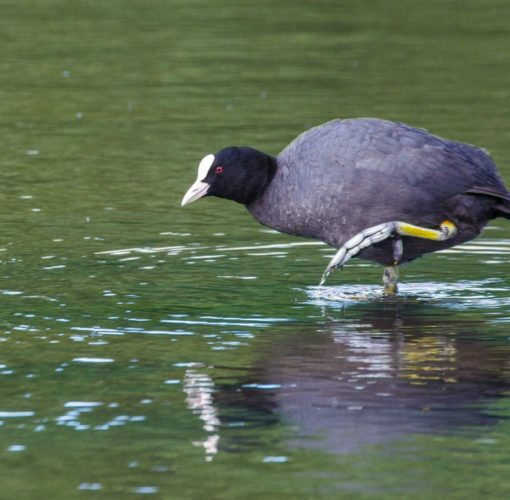 After the excitement of the GP I took the ‘big dog’ over to St Mo’s to get some photos, but the best I could do was a picture of the red eyed coot going for a paddle. That’s what made PoD. It was a cloudier day than yesterday, but still warm, just not as warm as it’s been. Tomorrow I think I’ll need to go and visit the physio to get his opinion on my knee.